I usually always buy my all of my camera gear right here in the US of A, because that is where I live and I like to go buy the expensive stuff in person at a Hunts Photo and Video store to make sure it arrives safely. Well, 4 years and 9 months ago I broke that personal rule to buy a Nikkor 600mm F4 VR lens from Canada. The reason I did so was because the lens had been unavailable in the USA for over six months and I was tired of waiting. So one week when we were on vacation we drove up to Montreal Canada and purchased the 600mm there. We made sure it was an ‘Authorized Nikon’ dealer before purchasing and once all the paperwork was finalized we happily drove back to the US of A with our new lens. Note: after tariffs and Canadian taxes it wasn’t any cheaper than buying from the USA. Lets move forward 4 years and 9 months to today and the VR on my prized 600mm decided to play up. Nikon Canada has a 5 year warranty on lenses from authorized Canadian dealers so we are in good hands right? Well the answer is not so simple. I know we have a global community, so what I want to recommend to everybody is buy local, not just local but from ‘Authorized Local Dealer’ for anything expensive in the camera department. At the very least check cross border warranty coverage before making overseas purchases. Bought the lens from Canada – live in the USA ($10,000 lens). Bought from an authorized seller (Canadian). Kept all my receipts and store information. Have problem with VR and the lens definitely needs servicing. OK – no problem, Canada not too far away, send to Canada for repair. Call a UPS store, turns out they have different insurance rates – $200 just for insurance, let alone boxing and shipping. To be sure your insurance will have maximum chance of being paid it really needs to be packed by the UPS store. So my hair turns gray and I decide to ship from local UPS Staples at their $106 price, versus $350 plus from UPS store. Now the waiting game begins, wait for arrival at Nikon Toronto repair center and wait for news of repair status, then safe return of lens. Some items like shipping would still apply if I had made the purchase local, but I have definitely made my life infinitely harder by purchasing such an expensive item across country borders. I will worry every day until that lens returns safely or I will be crying if something happens and there is not enough insurance to cover the item. Had I bought it at my favorite store like usual, I would just have driven it there and avoided all these little roadblocks. 36hrs since delivery – I contact them again (international call rates) – They find my paperwork after I tell them its in the steel Nikon camera box the lens is in. The lesson for everybody here in a nutshell is, unless you don’t care about warranty and repairs to your gear, you should buy from your country’s authorized dealer. Buying from another country is easy to do, but getting stuff repaired under warranty or even without warranty across borders can be another matter. Quite simply, you want warranty or repairs to your equipment without fear of problems, buy within your countries border and make sure they are authorized before you buy, make sure you keep your receipts. There are some cross border warranty that will be honored, some are worldwide, but not always and the time periods of the warranty coverage can vary dramatically. For example my lens has a 5 year warranty in Canada but to get it repaired in the USA the warranty period is much less than 5 years. Nikon is very strict about cross border warranties. On a special note, what I did was not a gray market purchase, that is a whole different matter. Big camera companies usually have subsidiaries in different regions of the world to import, price and repair the manufacturers product. Gray market is defined as a product not imported by the subsidiary. In USA the official subsidiary would be Nikon USA Inc. and Canada it would be Nikon Canada Inc. etc. Because each subsidiary is responsible for warranties, they set and make the rules. So a gray market Nikon camera item in the USA would for example be a camera that was imported by someone other than Nikon USA. The chances of any warranty being honored by the manufacturer on gray market items are slim to none or only that offered by the original seller who imported it. I used Nikon here in this example, but it could be Canon, Sony, Sigma or any other camera / lens manufacturer. It probably gets even worse when purchasing from places like eBay. In closing, be careful and thoughtful before you buy your expensive gear. I did not buy my lens from Canada to save money, it was because of availability, but if you are buying from another country you better understand how it will affect future repairs and warranties. Good Luck. Excellent article and very true for camera buyers here in Australia. Sometimes cheaper is not always cheaper in the long run. Actually it’s not true for all companies/countries. I’ve purchased Fuji gear from all over the world, especially Hong Kong from where I purchased (online) an X-T1 which had a EVF issue after 6 months. I emailed Fujifilm Australia to verify that they would be fixing it under warranty and no costs would be passed onto me. The customer relations officer assured me that it would be covered by warranty and I reiterated that the camera was bought online from HK. He said it was covered by their international warranty and would be fixed. I posted the camera to them and when I received it back a few days later it had been fixed (of course) and the technician’s statement listed a sensor clean and shutter service as a ‘complementary service’. They also fixed the slightly deformed side port cover. A few weeks ago I spoke to one of the guys from the ‘Australian Fuji Guys’ at a launch for the X-T2 and enquired about this and he said that Fujifilm does have an international warranty which includes Australia where Consumer protection law allowed for it to be applied so there’s obviously something in US legislation which doesn’t allow for this type of warranty to be valid over there. Also Canon fixes cameras which have international warranty. I live in Ireland and purchased a camera from Japan through eBay, Canon Ireland had no problems in helping me. Robert, you have my sympathy. Over here in the UK we tend to think of Canada and the USA as being much the same country, as far as commercial transactions go. I was surprised Nikon treated this as a gray import. Here in the UK ‘grey’ is seen slightly differently – we generally consider imported electronics / cameras as ‘grey’ from the Asian continent – Hong Kong in particular. The UK buyers (of Nikon, can’t say for the other marques) get a warranty on ‘official’ UK purchases which is a ‘European’ warranty and covers the entire EEC community – ie France, Germany, Spain, UK, Ireland, and MANY other countries – look up a list of EEU States online – all of those countries are covered by a product bought in ANY of them, and imported into the UK, and of course, Vice Versa – buy in the UK and get it fixed in Germany etc. I am shocked that Nikon get away with this, surely the ‘Northern American’ continent should be classed as a trading zone, and purchases made either side of that border are covered on both sides? Shame on you Nikon. (and the rest). My purchases are considerably lower value than your very expensive lens, and I have risked ‘grey’ imports several times. When doing so, there is a risk of warranty issues, down the line, but also, at the time of purchase, sometimes the goods are taxed twice. Once on the VAT (in the USA I think you call it ‘State Tax’ and then, there is an import duty comprising up to 20% of the total value of…. the item, plus the postage, plus the VAT tax – thats right, they tax the tax they already added! Out of approx 10 items bought like this, over the years, only once have I been asked to pay import duties. I think the shipping company paid them, or delivered from a UK ‘shed’ – but the product was still ‘grey’ despite being within the UK, from Nikon’s perspective. The stuff I buy tends to be under $1000 dollars in value, and has only 12 months warranty anyway. Relatively modest dslr bodies and lenses. That said, my recent purchase of an 18-140mm VR was something of a triumph. In the UK it was (prices in UK Pounds now) 540.00. From HK it was 249.00 – on top of which I sold my 18-105mm on Ebay for 190.00 so I got the upgrade lens for just 60.00, plus my old lens. It arrived duty paid, so there were no extra fees. 249.00 vs 540.00 is a compelling reason to shop grey – and on quality items, you ‘should’ (fingers crossed, and four leaf clover on the credit card) be ok. This ‘zone’ control of officialy ‘distributed’ merchandise is a real con. Nikon could, and should, offer worldwide warranty on all the products. The thing is, they set up ‘franchises’ in each country, and protect those franchises with the threat of ‘if you buy elsewhere, you can whistle for your warranty’. I hate this – it is trade protectionism, pure and simple. I can see why they do it though – if you could buy globaly on price, and get your warranty locally, everyone would buy from HK I suppose. Maybe the way forward is for Nikon (et al) to offer an international warranty upgrade, so, for my recently bought lens, say, I could register the lens and pay Nikon UK £25 to secure warranty of offshore purchased items. This would compensate the franchisee, who would provide nothing if the warranty wasn’t needed. One last thought – My trusty old Canon A1 SLR was bought in 1983 and was sold four years ago, in perfect working order – it had never seen the inside of a workshop. Maybe if they made this stuff to be more durable, instead of rushing out new camera bodies every three months, we would experience more confidence in the longevity of products. I hope your lens makes the round trip, safe and sound, and sorry you had such hassle, from a company who support their distributors more than their end users. It was not a gray market purchase – sorry I managed to confuse you on that. I think what might be a little sad here is – we are such a global community these days and everybody moves around, the warranty should be honored world wide as long as it was bought from a Nikon Dealer who was Supplied by Nikon. Gray market is when dealer/supplier circumvents the subsidiary imported goods. All the huge camera stores have their own methods of importing camera goods rather than through, say, Nikon or Canon, which is through un-authorized route. This then becomes a gray market product. They usually do that to make it cheaper and they have to label these items as gray market. Even though it is disclosed I often don’t feel the end buyer really understands what that means as far as warranty. In my case -> Nikon Dealer – Authorized Nikon import by the correct subsidiary – Just Canadian rather than USA where I live. But even that made a difference. You just don’t think the implications are that much or you think it will be alright, but it isn’t always. I personally think there should be worldwide support, that truly honors the original warranty worldwide as long as it was an Authorized dealer. That would make life simpler for everybody. Even that comment is a little complex because Nikon has a worldwide warranty, but in my case it would have been 1 year rather than 5 years as when I bought it in Canada. surely by taking the lens across the border from Canada to USA you created a grey market lens; you imported it into the USA and you are not the authorised NIkon Importer? I agree with sentiments below regarding a worldwide warrantees, but I think the warrantee system is the only way that companies like Nikon can ensure their local franchises control the local market. If you could get a worldwide warrantee why wouldn’t you buy your gear from Hong Kong? It is all about local market share protectionism. Hi thank you for your response to Gray import ( Not Grey import) Based in the UK I have purchased Nikon from HK or Japan via an importer in the UK and I have saved £1000’s of pounds, my next Purchase is a Nikon D4s £5200 here in the UK £3985 inc tax from Japan, ( where they make Nikon lol) this represents a huge saving £1200 is a lot of money. I have emailed Nikon UK who say ” we do not recommend this route to purchasing our product, however we will service or repair at a cost, I would have to experience quite a major fault for it the cost £1200 so I’m more than happy to take the gamble. The importer in the UK offers a 12 month warranty which is based in the UK. There are several companies in the UK who can offer service and repair to Nikon products. We are already in a global market so I agree Nikon should offer a global guarantee. I will continue to purchase my Nikon gear where ever possible to save money, the Camera comes out the same factory no matter where you buy in the world. Robert has a point, but only up to a point. First of all this is a special case as it is a very expensive item and the main issue seems to have been with the UPS shipping option. Obviously, when you buy from another country it would be worth checking the shipping options and terms of return, especially for such an expensive item. Mostly I think what this highlights though is how badly Nikon is organised – the structure in which the subsidiaries are organised is just laughable in a global world. If Nikon wants to be a global brand it should really organise its structure so that customers are not penalised. Imagine you have put many thousands into camera gear and then have to move to another country. Not good. Going back to the topic I do buy camera gear abroad, even from Hong Kong importers. DigitalRev pay all the duty and taxes, ship quickly and appear to have good service. And even if they don’t: A D600 costs a little below £1400 in the UK and is available for around £900 from DigitalRev – assume it does break and they don’t honour their warranty I would in most cases still be cheaper off to have it repaired in the UK. So I really don’t see why I should buy the camera off Amazon instead of DigitalRev, especially seeing how good their reputation is. I think purchases should be evaluated on a case by case basis a not on a general rule that is dictated by rigid rules set by a company more interested in its structure than what benefits the customer. There is one aspect that should be noted: buying from an actual brick and mortar store in your area may be worth paying extra as it allows you to try the gear and ideally should also help with repair and advice. If you have such a store it may be worth paying extra over online retailers. But that is a different argument to saying you have to buy in the same country. Part of my frustration is the shipping and I knew that, but when you buy it, you find ways to convince yourself it’s not a big deal and you don’t need to worry about such things. This is a high value item, so it makes the shipping process more complex, with more limits and rules than you can poke a stick at. The other part that frustrates me, is we did buy from a Nikon Authorized dealer that was supplied correctly from Nikon and even listed in Nikons Authorized dealers search engine. But yet, cross border warranties are much different. 5 years versus 1 or Nikon may have honored it for 2 years in the US. I personally think the part where you talk about how Nikon is organized is right on the money. It should be organized better and more worldwide, you would think in this day and age it would be. Thanks for you comments, they are very thoughtful and hit the mark. Nikon USA won’t repair gray market items, no, not even if you pay them. They also stopped selling parts to independent repair shops and doubled their repair charges last year. It seems we need another class action lawsuit like what happened with the D600 to get them to behave decently. Also, this “localization” leads to supply problems such as a shortage of a particular lens or camera in one country but they can’t ship from another country because it would have the incorrect serial number for warranty, etc. This is what really caused your problem in the first place — a shortage in USA but plenty of lenses in Canada. Shouldn’t your gripe be with the lack of consumer protection laws in the US that lets them get away with that? I have SPECIFICALLY asked Fuji here in Denmark if they honor foreign (US & Japanese) warranties and they said “of course, we stand by our products worldwide” (and they might run into issues with consumer protection laws as well should they try not to). By the way, Nikon does honor the warranty worldwide but not for the same amount of years. One would have to ask themselves, why is this so ? If you have an official warranty card properly filled out that states X years, then it should be honored at any official repair center. That would be too logical and too easy. Quality of service often depends a lot on personal attitude of employees, thus warranty service you receive may differ from service center to service center. In my experience (where I live) both official and gray service centers spend more time trying to prove this repair should not be covered than actually identifying what’s wrong with equipment. Therefore casual or even extended warranty proved useless. Ever since this happened I bought insurance for all my equipment. It also covers equipment shipping insurance, therefore limitations of DHL or UPS insurance are irrelevant for me. Besides they are ready to cover repairs regardless of warranty status of equipment. I strongly recommend to do the same to everybody. Smart idea buying the insurance, it is something we have toyed with for a long time but procrastinated in doing. maybe this event will change that, especially when you consider the total value of my camera collection. Would love some additional information on the equipment insurance. I’d prefer to purchase through Nikon USA, however, I have wanted a D700 for a long time and it is no longer available through that channel. Purchasing new requires a grey market purchase – it isn’t about the price – and I’m very worried I’ll get the lemon and need immediate service. Never even considered that insurance might help. Would it, do you think? Thanks. Hi Johanna, I am doubtful that insurance would help, unless it was a specific insurance for faults / manufacturing defects etc. Most photographic gear insurance is aimed at loss or accidental damage, rather than a fault developing in the equipment. You would need to verify that failures are inclusive to whatever policy you take out. If you are buying from overseas, as long as the retailer is reputable, they will honour the warranty. The only bind is that you would need to post the camera back to them for inspection and repairs. If the cost and delay, in the event of buying ‘a lemon’ would not be too bitter a pill to swallow, maybe that route would suit you better? I know insurance can be expensive, but well worth getting some prices in, given the value of the D700. Thank you Ross. Wasn’t thinking clearly about insurance coverage – you’re right, not going to protect against what I’m worried about anyway. Johanna, don’t forget about the insurance against theft and breakage that most major credit cards offer. You’ll likely have at least 90 days, or longer with American Express, when you buy that way. I would say, you get more predictable results and an easier path to repair or replacement. What would happen if you were living in Canada for several years then moved to the USA. All you camera equipment was purchased in Canada, then you needed repair service in the USA. Also what if you’re visiting from Europe and your camera breaks, won’t the US repair center fix it? Susan, this is the nub of the problem. If you splash hundreds (even thousands) on camera gear, and then get a problem, out of the country of purchase, you have NO warranty, and are on your own. Nikon treat photographers as two distinct classes – pro, and hobbyist. If you were covering Nascar or a Grands Prix race, Nikon (and Canon, and others) have a booth where they have repair technicians, and spare lenses to lend out to people who need repairs / adjustments to the gear – IF THEY HAVE A PROFESSIONAL ACCESS PASS to the venue. If you are there as a hobby / enthusiast, and your D800 croaks on you, while actually at the race, try taking the camera to them – they’ll just laugh at you… not openly, but, I guess you know what I mean. This is market manipulation, and a way of Nikon to get out of their warranty responsibilities – by claiming the camera was bought in a different country – when is a Nikon actually a Nikon then? It would seem that, if it is a Nikon outside of the country of purchase, then, it is an expensive pile of plastic, chips, glass, and wire, and not actually a Nikon at all. That is what Nikon are saying… we wont fix it if it wasnt bought in this country! Yet, what is the first thing you do with a camera? Put it in your bag and jet off to shoot landscapes in other parts of the world of course! ….and, not just Nikon, this applies across the board, to all manufacturers. If the gear was bought from an official distributor in Chile, it should be covered for repair in Iceland, New York, and Melbourne too! Nikon (and the rest) – get off your butts and do the right thing here… it’s been an issue for 30 years. Well said – I also believe as long as it was bought from an authorized dealer (regardless of country) the original warranty should be honored worldwide and thus making ‘a Nikon – a Nikon worldwide’. I qualify for Nikon NPS status which would give me preferential treatment, but I don’t apply because I don’t like the personal information they are asking me for. The other issue that many people do not realize is that Nikon warranties, at least in Canada, are non-transferrable. This is clearly stated on the Nikon Canada web site. While I have never bought used equipment, I have sold equipment in the past. In all cases I have made sure to point out to the purchaser that the original warranty on the camera or lens is not transferrable to them. In some cases they have pointed out to me that they have seen other ads in Canada claiming that a lens or camera body still have ‘x’ number of years of Nikon warranty left on it. I always refer them to the Nikon web site so they clearly understand that these other ads are misrepresenting the warranty coverage on Nikon product. Some stores, like B&H for example, are very clear when you try to order a Nikon lens or camera body that they will not even ship to Canada. This may be a restriction from Nikon, or it simply could be that B&H has realized that they don’t want the hassles of dealing with cross border warranties. Cameras/lenses are likely not the only products where warranties are not international in scope. Some products, like automobiles, cannot even be imported across borders by the original owner without special government approvals and permits. All great points, THANKS !! We want to think we are global, Skype, Email, the web and others have certainly made it so. Yet there are these little technicalities that exist when buying global. I think the true one point that matters in this article, you must understand where you stand before you buy. This is something I learned the last few years and may in part helped you circumvent some of your shipping issues. I used to go directly to the UPS shipping depot with parcels to ship and of course insure them. Due to fraudulent insurance claims made these days, they sometimes required the parcel to be opened and the item quickly liked at in order to establish that the item was in good condition and/or there wasn’t a box of bricks in the box. In any case they had no issue with my or anyone’s packing the items ourselves in order to insure…even a lens I sold almost as expensive as yours. The second thing is their rates both on shipping and insurance for any parcel or item. They are considerably less in price than those UPS stores. I set out to find out why? Simply put although those UPS stores appear to be company owned, they’re not! Basically they are franchises, many of them former “Mail Boxes Etc.” Location/Businesses. These independent UPS Stores often set their own prices and rules and they are substantially more than simply going to an actual UPS depot. When questioned, they played ignorant and would only respond that they are UPS shippers and know nothing about different rates vs. The actual UPS depot. Staples is another authorized agent of UPS and as you saw, also sets their own rates and insurance rules. UPS stores not only wants to over change for shipping but scare you I to having them pack your items if you want full insurance. Personally I found this bordered on a scam. Almost no one I know is aware of this regarding to most of the UPS stores. They are not UPS but simply an independent business that secured the right to use the UPS and their shipping system in order to set their rates and set of requirements for them to insure a parcel. No matter how convent their locations are, I avoid them like the plague. No doubt UPS has gotten more expensive and I’ve heard that some UPS stores dropped their prices a bit when word got out that their rates were substantially different than the UPS depot, but still the differences are substatial. In contrast, many of the Fed Ex copy and business centers are either owned or run by Fed Ex and is e the same rates and insurance policies that the Fed Ex depot uses….including not minding one packing their own expensive items for shipping with insurance. I’ve come to repeat them for this. Anyhow, this has been my personal experiences. This article just points out another reason we should stop using Nikon gear. Nonsense. They are all the same – Nikon, Canon, etc, etc. This is a reasonable article with a very misleading headline. While the information contained in it is correct, and, I think, rather obvious to any well traveled person, which many photographers are (especially those with long lenses), it doesn’t warrant the space Photography Life has given to it and the headline isn’t relevant to the article. A growth pain on the editor’s part or just irresponsible journalism? The title was changed from what I had and you are correct, it doesn’t quite reflect the content as it is more about understanding what you sign up for (as far as warranty is concerned) when you purchase gear. I am sorry you feel it’s a waste of space, however I would rather have some readers become seasoned travelers without the ouches ($ hard spent) or hard lessons. Not everybody thinks before they buy or they buy and think it will be ok. Isn’t this site about helping and educating fellow photographers? For the most part warranty is such a boring topic, not everybody pays attention when buying, or the need to have it now overrides the risk. It was a growing pain on my side, but I was aware of what I was doing when I bought the lens and I still did it. Could I go back and change things and I would have bought it in the USA like all my other gear and sleep better at night. I guess I believe strongly in being an educated consumer. And that’s especially true about things that are expensive. Caveat emptor works for me. The main reason that I read the article in the first place was that I buy nearly all my gear used, and most of it on Craigslist. Some people think I’m crazy but with the number of photos I require to be taken, with time stamps, and the questions I ask, etc, I have literally never had a problem. That includes a D3s, D4, D800, lenses, ball heads, you name it. I think that camera equipment sales have been commoditized and the depreciation of used equipment due to the refresh cycle makes buying from dealers an exercise that needs to be constantly challenged. One point your article makes clear is that camera companies operate as independent units in each country they do business in. NikonUSA is not Nikon, its NikonUSA and if you buy one of their products, they will service you under warrantee, and if not, for a fee. I currently have a 500 f/4 VR in for service with NikonUSA. I bought the lens used 4 years ago but I knew that I would not get the warrantee transfer. For me the $2500 savings was, in part, self insurance on a warrantee-able repair. This current repair will cost me $420 and so I am still quite ahead of the game. I actually understand every point you are making here and agree, just by you highlighting these things you bring some important points to the forefront. It’s OK to do whatever you do, as long as you understand the consequences. Your points are a lesson in themselves. YOU are being harsh and unreasonable. Nasim has the right to be pissed off and share his frustration here. As much as we might like to, we can’t get together today and have a beer with him while he justifiably complains about his experience, so this article will have to do. Nasim = Robert. Same sentiment. OK, fair enough. Where to start? For one, the exclusion of warranty coverage for products purchased outside the US. Buy a cool lens at Yodabashi Camera in Tokyo and you’re out of luck if something goes wrong with it when you get back home. Then there is the infamous D600 dust fiasco, in which Nikon denied the specific problem and repair solution until, apparently, forced to do so by recent class action lawsuits. Yes, I got a “dusty” D600 in Sept. ’12. It has stabilized at 12K clicks after I did many, many cleanings. I don’t want to risk sending it back because new problems might occur — and I just don’t want to deal with Nikon anymore. Before that, they denied there was a left side autofocusing problem with the D800 until forced by angry customers to concede. These are not the behaviors of a customer-oriented company. Meanwhile, I’m sitting on $10k + in Nikon gear and wondering how much longer I will be a Nikon customer. Anyway, a critical thing that make the D600 and D800 so awesome as photographic tools compared to Canon or others is the Sony sensors. We have to put up with a lot of crap to get this benefit, but perhaps not for much longer. What else? This is not about warranty policy, but I still hold a grudge against Nikon for buying a D600 + 24-85 in Sept. ’12 only to have them essentially give the lens away a few months later. Their rebate programs almost always force you to buy a body to get deals on lenses — which favors those with lots of cash on hand who are thinking of switching systems. Existing customers don’t benefit except for the occasional lens only rebates. My bad experience with unpleasant Nikon sales reps at Imaging Expo ’13 further alienated me. Reps from Canon, Sony, Panasonic, Sigma and others were very pleasant at this same show. The two different Nikon reps I encountered on two different days were rude and unfriendly. One person’s experience, FWIW. Cheers. Hi Michael, let’s not overthink this, the problem is simple. You buy gear in country A, and use it in country A,B,C & D.
The information offered by Dave (D&A) should be noted by all who have to ship via UPS or FEDX. My professional niche in photography is medical research and product photography, entomological studies, gross specimen and criminal forensic photography. I do a lot of shipping. For some of my clients I provide hazardous material boxes with return service labels. I either ship the box to them with the label inside or send via email a return service label and when they place the specimen in the box all they have to do is drop the box off at any UPS store, (at no charge to them), or give the box to any UPS driver. There is no fee for this. I know that most folks don’t have their own UPS or FEDX accounts. However, as Dave points out your shipping charges will be much less when using UPS if you take you package directly to a UPS hub. The UPS stores who take packages with a return service label cannot charge anything for that service but if you want them to ship indeed they are independent business owners who up charge the UPS shipping charges to make profit. This is not unlike the fast food hamburger joints that purchase a franchise in order to display a recognized name. One might also find cheaper shipping and packing prices at an independent Pack & Ship outfit, (a mom and pop store), since they must compete with national recognition and want to attract the business. Just an additional note, there are FEDX stores that are not corporate. Make sure if you are shipping with FEDX you know the location is a corporate store before utilizing their service or you might find the same occurrence as with UPS stores. This warrantee issue should not be blamed on Nikon. It should be blamed on the Authorized Nikon Dealers in each country or market area. They are the ones who enforce the rules on warrantee or non-warantee repair of foreign bought equipment. They do this to protect themselves from differing customs duties. How long would Nikon USA stay in business if they had to service cameras that had avoided U.S. customs duties by being bought from Hong Kong? The warrantee and non-warrantee repair weapon is the only thing they have to protect their market from being flooded by equipment that can be sold at a lower price because it has by-passed the normal customs duties. Don, you are wrong. 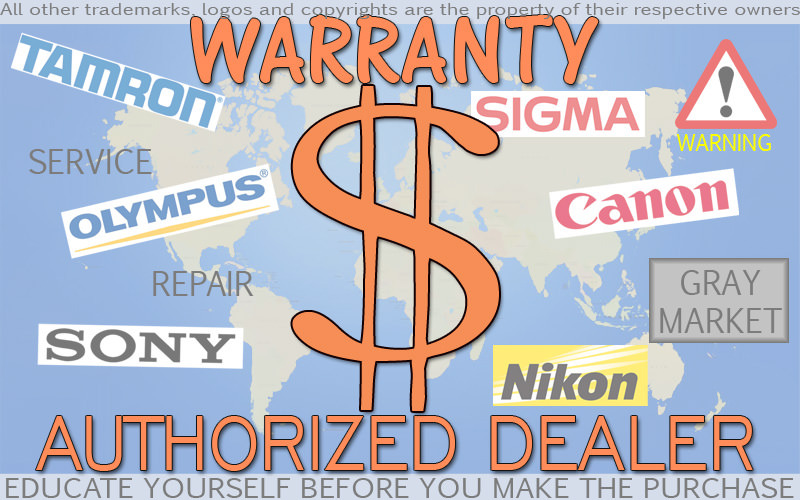 Dealers do NOT enforce warranty rules, it is Nikon, and Nikon alone. When a dealer finds a fault on a warrantied camera, he will seek Nikon’s permission before carrying out the parts and labour involved with the fix. Nikon no doubt supply dealers with a ‘carry on regardless’ list of repairs that they don’t need to authorise, but you can be sure expensive repairs need a green light from Nikon. Nikon don’t care where the camera was sold, as it yeilds similar profits around the globe – the tax, as you rightly say, does vary, and oh boy, dont we know it in the UK… import duty of 20% and VAT tax at 20%. This is money Nikon, or a dealer, never sees since it goes into the pot of the government. Having manufactured the camera, it should be warranty repaired worldwide, end of story. You mention servicing – well, servicing is normally a chargeable matter anyway, not a claim for warranty is it – just a ‘service’ just like with a car. Nope, Nikon are playing us all for fools with this warranty issue. The dealers are, at the end of the day, businesses interested in the bottom line… yes! If you look at the summary article you’ll find that Nikon is not the only camera brand that does not provide a warranty on ‘grey market’ products…neither will Canon or Sony. Canon warranties on SLRs are cross border Canada/USA…but not on video cameras. On a related note….there are also differences in the duration of warranties depending on the country in which a product is purchased. For example, the new Tamron 150-600 is sold with a 6-year warranty in Canada, but only a 2-year warranty in India. The fact that the ‘same’ product may have different warranty coverage in different countries is not unique to cameras, or to Nikon specifically. For example, having worked in the heavy truck business in a previous life I can tell you that the warranty expense on Canadian trucks is significantly higher than those running in the USA. As a result the warranty accruals that the Canadian operating company would need to apply to its Canadian pricing was higher than those taken by the US Division. It is also very common for product pricing to vary significantly by country. Again, this is not an issue unique to Nikon or any other camera brand. Product pricing is a function of manufacturing costs, distribution costs, competitive pricing levels, administrative/warranty costs, and target mark-up among other things. Some countries with small market potential are simply much more expensive in which to do business and the price of products sold in that market need to reflect that reality for a company to be able to make any profit selling its products in that specific market. We should also not assume that a company makes the same amount of profit from the same product regardless of where it is sold in the world. Variances in exchange rates, forward hedging on those exchange funds, intensity of competition etc. all have effects on the relative profit per unit sale of a product. Some markets are much more lucrative in terms of profit per unit than other markets. In terms of the real value of having an international warranty…there are practical considerations when traveling with a camera. For example, I was in New Zealand traveling extensively for 3 weeks last year with my D800. If it would have broken down in NZ would I have taken it in for warranty there even if I would have had international warranty coverage? Not a chance. I was moving locations every day (and usually not close to any main city)….other than Auckland at the start and end of my trip I never returned to any city…..I was 10,000 miles from home…with no way of knowing how long a warranty repair would have taken. I would have used my back-up camera (Nikon 1 V2) for the balance of the trip and had my D800 serviced when I returned to Canada. Hmmm. well, I once attended a general sales meeting with the CEO, area managers, and area representatives at a product launch. One of us (to the question ‘what should the price be?’) asked, what is the inclusive production cost per unit? The CEO, once he stopped laughing, asked, what the %&! *$ has that got to do with anything? The rest of that meeting hinged on what price was being charged by our competitors, in the same market, for the same (near as can be) product, and that, was, the price that was set! Perhaps not all industries operate the same, but that was my experience – I discussed it with my area manager a few days later and he confirmed that this was the usual method for price setting… one doesnt want to sell below achievable prices and give money away, nor does one set too high a price, thus clobbering sales because competitors are cheaper. You’re absolutely right that companies do not set pricing in a vacuum (or at least they shouldn’t LOL) and do need to consider the pricing levels of their competition. This includes the features and ‘perceived value’ of those competitive offerings. The amount of premium that they are able to get, or not get, for their product will depend on the amount of true differentiation that their product delivers to end users. There are different pricing models that companies use to determine market pricing. At the end of the day it all comes down to gross margin per unit and their fixed overheads so they can determine their breakeven point in terms of market volumes….i.e. revenue – variable cost = margin. I’m not very current with Canon product, but I do believe they have a new, mirrorless camera that they have introduced to the Far Eastern markets only, and it is not available in North America. What Canon likely did to determine if it was feasible to sell it in North America was calculate their anticipated variable selling costs and the price at which they’d need to sell it at wholesale (then add standard dealer mark-up) to compete with similar products in the North American market. For fun, let’s assume they were going to make 10% margin selling a camera body at $500 wholesale (the last reported Nikon margin was 9.4% I believe)….that’s $50 per unit. If their fixed costs were going to increase by $5,000,000 in order to sell the camera in North America they’d need to sell 100,000 units annually just to break even. I find it interesting that the big players like Nikon and Canon have wholly-owned subsidiaries to which the parent company sells. This is commonly done as a profit maximization/tax avoidance strategy by global companies since it allows them to control how much profit is reported in specific tax jurisdictions. You lot have it lucky with only warranty problems an issue. In NZ Nikon refuse to service any item, ever, IN or OUT of warranty,that you can not prove was bought in NZ from an NZ authorised dealer, even for a fee. Canon and Fuji will fix anything for a fee no matter where it was bought. Generally costs 30-50% more to buy from authorised dealer. One “consolation” is that in many cases the fee for fixing cheaper items is more than buying another “grey” item. Which contributes to Nikon’s turnover and the totally wasteful throwaway society. Another is that your grey dealer may be able to get it fixed in HK faster,cheaper and better than Nikon NZ anyway. I understand Nikon Australia will fix anything for a fee. It amazes me how much variance there is between regions !! Fees at Nikon repair shops are as ludicrous as they can be. Cleaning my D3 costs me $50!! Canon does it for free for professionals. Mr. Andersen, I’m sorry you’re having trouble with your gear. I really hope you get it back in one piece. Please see my question at the end of this note, especially for you. In general, for amateurs, I disagree with your overall thesis. It’s a different game for pros, who can write off the cost of equipment as a business expense. And if the grey-market savings is only 2-3%, well that’s not worth it either. But if the savings is more than 10%, in the long run, I think amateurs should take the chance. In some markets the savings can be massive: in the UK, goods priced in pounds are often priced in the same number of dollars in the the USA. Grey-market buying offers huge savings. At time of writing, a dollar only costs 60 pence to buy. Now to close with an honest series of questions for Mr. Andersen: you wrote that you bought in Canada because you were tired of waiting in the USA. OK: how much longer would you have had to keep waiting? A month? A year? In the meantime, you had your Canadian lens in your hands and more importantly on your camera. In the intervening time between the time you got it and the time you would have gotten the USA-sold copy, this lens either helped you make money, brought you personal joy, or both. How much is that worth? You may not be able to quantify it exactly, but have you tried? To twist a phrase that gets used too much, the best 600mm f/4 lens is the one you have with you. Although you may not agree with me, I think buying in Canada was likely, for you, the right call under the circumstances. Boy do you know how to hit a nail on the head! 1st: I think saving 15-20% on an item is awesome, I think its ok to do that as long as you know what you are signing up for with warranty. A lot of people will do that then not keep any money aside for when that repair needs to happen and they get stuck and disappointed. I wasn’t saying don’t do it, I was saying if you want predictable warranty support, only an authorized dealer will do that. I think it’s a personal choice that each individual must weigh up on gray market items (warranty versus price). I personally prefer to have the support, I have had a Nikon D4 (my first) play up a month after purchase and a week before I was about to leave for Yellowstone Photo Trip – Because of timing and support I got a replacement camera delivered in time for my trip. Part of that was Hunts Photo and Video, more so than Nikon but they both helped make it happen. That has value to me. Answer 1: In this instance it took approximately 2 1/2 months and Hunts had a 600mm in stock. Answer 2: I was on vacation when we bought the lens and the very 1st day we had that lens out on the lake, I got my lifelong dream photo, and I am not pulling your leg. That really happened. We had the lens out on the lake in our 16ft fishing boat trying to see if it was possible to hand hold that beauty. A lot heavier than I was used to hand holding (200-400mm Nikon F4 VR). Anyways, a bald eagle swooped down to grab a fish and I managed to snap the photo I had seen in my mind and dreamt of getting but had been trying for five years and had not succeeded before. Here is a link to that dream photo, please note it is taken in New Hampshire where there were very few bald eagles at the time. Answer 3: It was the right call at the time, and I knew what I was doing when I did it. Now that it comes to getting it fixed I question my choice, but I would do it again – LoL. The urge to buy it now overrode everything else at the time. BTW that 600mm lens has gotten me many photos I am proud of, and who knows, but two months later I may not have had the money to buy it. Fate is Fate. I think the point of the article is to open peoples minds to the madness of warranties and various methods of buying items and ensuring you know what you are signing up for. As long as the buyer understands the consequences of their purchase method, I think whatever they decide to do is fine. Just be educated. Thanks for your considered reply Rob. Your points are well taken. Your eagle-grab image is among the most spectacular I’ve ever seen. If anyone’s read that far without clicking the link, stop reading my post and CLICK IT RIGHT NOW. Rob, spectacular image. Truly one of the greatest Eagle shots ever. And not baited, even better! That image just happened, like it was meant to be – it is not even cropped – D3X full frame, almost missed it, another 1/4 inch and that wing would have been cropped. In Canada, US bought items are not honored by Nikon Canada (from a personal experience). When buying I always buy from a local store. In my opinion, it is just a game manufacturers play to fattened their (already FAT) bank accounts and empty our (already DEPLETED) pockets. These are the same items made by the same manufacturer and the money ended up in the same bank account. There is no need NOT to honor a warranty for item bought in a “foreign” country, if they really need the money then add a $50 charge for local warranty and get it over with. If I bought a $10,000 lens (or a $700 camera), Nikon got their share of the money no matter where I bought it. Again, this is a monopoly game by corporations that, on one hand, benefit IMMENSELY from this global community we became but, Heavens forbid, actually played alone with this community. I just sent my D600 to Nikon Canada. I live in Canada and bought the D600 from eBay USA – serial number is USA. Sent it in and they are working on it. No problem. Thanks for the article, Robert! I have to say I was always worried about buying products from abroad, and so when I bought my D610 I got it from a local dealer in the UK, with the normal European 2 year warranty. I have always looked at grey market imports with envy though, since the UK price of items is usually well marked up even more than the 20% tax. I guess that electronics manufacturers get greedy in the UK. Many friends have bought cameras as grey imports and not had any problems. That said however, when I wanted to buy into the Fuji system and was unsure about the step, Fujifilm US had massive savings on lenses and cameras, I ordered an X-E1 and kit (including import duty and delivery) from AmazonUS for £540 compared to the £790 price here (the kit lens here alone is £450!). Such a massive saving, I went and ordered the 27mm fuji lens for a total of £150 compared to £350 here. It’s risk versus dollars, if you feel the savings are worth the risk, then you save the dollars and pay cash for repairs. Gray market items generally have no warranty support from Nikon and Canon, other than cash. I am not sure but I believe here in the USA I can’t get a repair by an authorized repair center without a receipt from an authorized dealer. That is what I was told by Nikon USA on my 600mm. BTW – Some items are low enough in cost, the risk doesn’t matter as much. You simply replace the item. There should be a globally accepted repair / warranty system – A Nikon is a Nikon – We are global these days, so should the manufacturers be. So…what about buying on Amazon vs at a local dealer? It’s just an entry level, but the savings would buy me another (cheap) lens. The dealer provides unlimited advice and troubleshooting, but Amazon is cheaper. I don’t have anything to add other than know what you are getting into before you do it, Amazon is not an authorized reseller – there are standard worldwide warranties then there are local Nikon warranties that may go longer (years longer) – you have to weigh costs versus savings versus warranty. Hi Kirsten, good question, and most would say, if you buy from Amazon, you are ok – as the item will be bought within the country that you reside, it will contain the correct warranty card, and then, Nikon will recognise the serial number as being ‘official’ rather than ‘grey’ merchandise. Life is never that simple is it? I will share an experience I had four years ago, so at least you will be aware of the possible problem. I was keen to by my (now cherished) Sigma 10-20mm zoom lens for my Nikon. I saved up a while and when ready, spent some time shopping around. This was a lens that wasn’t going to be used much, so getting value for money was particularly important, as it was going to spend 99.5% of the time on the shelf. Well, it worked out to be more like 80% and there are subjects for which it is appropriate beyond any other lens owned. Amazon (UK) came up trumps, the NEW example (15 available 43 sold) was priced about £55 lower than anyone else, and a staggering £150 less than my local dealer. I bought it, paying at the same time of course, and it arrived two days later (ordered a bit late in the day). After trying it out and loving it, I looked at the invoice, and then the warranty, as you do. It had a USA warranty… so… I traced the Sigma ‘Official Distributor’ in the UK, one ‘Intro2000’ if memory serves. I gave them the serial number, explained what I had found, and asked the obvious question. They were prompt, I’ll give them that… but… they were clear enough. As they were official importers of the Sigma products, they would not be able to offer any warranty repair to my lens, should it become needed. This gave me a sick feeling in the stomach, as I had been so careful when buying this expensive but ‘not to be used often’ product. I rechecked the paperwork to find that it was NOT Amazon, but a ‘Market Trader’ selling via Amazon who had been selling the lens. There was a contact email address for the seller, and so I wrote to them expressing surprise that they were selling, on Amazon UK, products that have no UK warranty, and asking them for the scenario, if the lens failed. In total fairness they were very reasonable people. They explained that they imported products (grey) from both America and Asia, and that the products were obviously identical to those sold via the official importer in the UK, but that the warranty was valid only in the country of origin. They had their own camera repair department, and any warranty work was done by them, within the UK, unless it was a more serious issue, in which case products were returned overseas for repair (or replacement) under the Sigma warranty in the country of origin. They did two things. Firstly they extended the warranty to five years (from three) – and secondly, they gave me a £60 (approx $90) refund for my understanding. The lens being amazing and fully brand new and functioning perfectly, I accepted this, and the lens, to this day, has never missed a beat. Moral: If buying from Amazon, read the small print before you ‘order’ anything – it will say something like ‘Sold by Amazon UK and fulfilled by XYZ Trading UK Ltd’. Or it will say ‘Sold and fulfilled by Amazon UK’ (or if you are stateside, Amazon.com, presumably). I really really appreciate the time you took to respond so thoroughly to my question. I live in the US so I will likely have less of a problem in regards to warranty. However, I will be sure to check the fine print as per your suggestion. One bonus about a local dealer is the personalized service and attention should a problem arise (not to mention supporting a small business). It’s just so hard to swallow the extra mark-up when I can get the gear for cheaper and be able to afford an extra lens (a coveted 50mm) for the same price on Amazon. I’m Alex, and I’m from the Philippines. In our country, Canon is the only camera manufacturer that has full support towards authorized dealership…we do have Canon Marketing Philippines (CMP, as what we call it, along with it’s 3-year product warranties), but such a thing like “Nikon Philippines” does not exist. We do have several camera stores which may be considered as authorized, since they are selling Nikon products with 2-year Philippine Warranties (CDSC, as what we call it here…). The main issue in our country is that the entities that previously hold the psuedo-ownership to what we know as “Nikon’s Product Selling Authorization” in our country, has been letting it go, every now and then. In other words, authorization in our country has been a long shot ever since. As from my fellow photography peer’s experience here in our country, whenever we purchase Nikon’s products with 2-year warranties, if ever we need anything repaired or replaced, it’s either we go to our local technicians, or we send our units to the authorized dealer where we bought it, for them to forward it to another country (I think, the nearest would be Nikon Hong Kong, not that sure about that, though…). The main impact of the scenario is that CDSC units sell at a higher price, as compared to Gray market or individually-imported units, with the price of half-assured warranties. Well, look at the brighter side, USA offers a 5-year warranty on all Nikon products purchased in the USA. I do hope that in the near future, our country would be able to get support from Nikon, just like yours…:D It may be a long shot, since we’re in what we may consider as a third-world country, but I’m still not losing hope. Kudos to you and the Photography Life Team! Thank you – I also hope purchasing and warranty gets more worldwide and easier. It really shouldn’t be that difficult. Straddling a product’s warranty within a country is not a good practice! After all it is photo equipment and people do travel with their gear. What if the gear broke while you were overseas and instead of taking it to the nearest authorized dealer you have to ship it to your home country? Who is going to pay for the cost of the trip you had taken? IMHO this warranty and service business is another cash cow just like for cars and pretty much other products. Whoever said the industry will regulate itself was lying through their teeth! Need more tougher regulations! I heard EU was working towards this issue a while back. My son, who lives in Hong Kong purchased a Nikon D700 Camera & 80 – 200 F2.8 Zoom for me and brought them to Europe. I have read & was also told that the Lens is covered by a Worldwide Service Warranty, but the camera is only covered by a local warranty in the country of purchase. I have the 2 warranty documents in front of me and indeed the above conditions are correct. Thanks a lot for such detailed article Rob !!! Here is the Latest Incident that NEARLY happened with me, but I was able to react in time after googling out…..
Past Week – Last Week of Nov 2014 – Tamron 150-600MM F5-6.3 Lens came to stock for Nikon Mount after around six+ months !! When I saw this amazing lens on Amazon as ‘in stock’ – I hurriedly ordered one for me; this being the most costly item in my whole enthusiast kit !!! The seller was listed as Fumfie on Amazon and they shipped the lens to me on Time.. I paid 1185$ for a 1069$ lens, and got a so-so tripod and a remote shutter along with Microfiber Cloth as freebies (off-course my enthusiast kit had these items and I din’t need them).. Also ordering from Amazon meant I dint pay any tax on the item I asked to be shipped to MN… I remember checking Address of the Seller which was NY and Rating of the Seller as 4.8+ with over 1000+ reviews. I knew that Seller was liked by other Buyers so there are very less chances of any issues ! The lens arrived to me around 8 days earlier then the tentative date, again impressed by Seller. PS : Looks like I forgot to tell, today being Cyber Monday and after noticing so much of these rare lenses in stock all of a sudden I became hopeful, searched a local Authorized Tamron Dealer from Tamron Site, called them and got the Lens !!! There was a time today evening, when I had two of those lenses sitting at my table at my home for around one hour when I was packing the one to be shipped back, and opening mine for Testing.. I am totally blown away by performance of this lens (the reason – I have never ever shot anything from a Prime Lens that PROs like yourself use..) I have shipped the Lens back to Seller via UPS today evening and waiting for it now to be delivered back to the Seller so that he can credit the money back to my credit card !!! In short — this article scared the hell out of me at a time !! but then this is the article that encouraged me to take the right step and return back the GREY MARKET LENS ! I am so very thankful to you and other commenters in this article.. Many thanks everyone !! Rob If you have lived in a third world country as i am, you would have gone insane. about. if you happen to come to Africa be prepared since everything you buy does not have warranty nor Authorized re-seller or service center. customer service is a joke and workmanship will make you crazy. Im based in NEw zealand, looking at buying all new equipment and not a resident, travelling a lot.I was looking at tis info since i can’t afford to abort a trip and go without equipment.What if i have to leave the county permanent, i can’t go back to my local retailer. So all pro gear should have international warrant. How come we have al this stories in a GLOBAL economy , where people travel to get great shots that warranty is not given although stated? This is something i’d expect from a low grade brand but not the leading brands NIkon &canon. I live in Canada. I bought a Nikon D600 from eBay USA. Had problem – sent prepaid to Nikon Canada. They emailed me when they received it. Next day email their findings and they are going to fix it and send it back to me – no problem – no paperwork. USA serial number. If I’m reading this right, this is a cautionary tale about getting a lens serviced by mail, rather than by dropping it off at the brick-and-mortar store you bought it at, and perhaps that the Nikon service system in Canada isn’t very good. If a Canadian bought this lens in Toronto but is currently in Vancouver, how would their experience have been different? Unless I’m missing something, the only difference would be any additional delay or expense related to shipping across the border. Was there something about the shipping hassles that was related in particular to shipping internationally? Are there significant delays or additional expenses for shipping camera gear between U.S. and Canada as compared to shipping within the U.S.? I understand their not being a warranty on grey market cameras, but I don’t understand not being able to get a grey market camera serviced for a price. At the end of the day they are legitimate products manufactured by the same company. If only the warranty was an issue I would purchase grey market without hesitation. The savings would be enough in most cases to offset the chance that you would need to have a repair done under warranty. My problem was not “not being able to get it serviced”, it was I had to ship it at my own cost and insurance. UPS and Fedex only offer so much coverage, so when I sent my 10 grand lens I only had $5000 insurance on it. Had I bought it from my local store “Hunts Photo and Video” I could have taken it to them and the risk would be theirs. I got it all fixed but there were moments when my lens was in transit theat it was totally undervalued and high risk to me. An old post but due to the unending lesson entailed, it’s worth refreshing and I am posting this to hopefully help other people think twice beofre buying from online trades and unauthorized dealers. My story: Here comes Sony SLT-A77V, a 5-years old, gently used with only 8K shutter used will attract many onlookers. I purchased it for $280, from DCfever online trading (Hong Kong), similar to how Craiglist works. Everything works well during the spot testing and deal (no return policy-which I stupidly agreed). However after 48 hours, when I turned it on again- an intermittent error occurred. So I did try to purchased new compatible battery, as well as new & fast SD Card 95mbs- but still it didn’t solved any. Left with no other choice-I have it repaired by Sony Service Center, it took about a week, the diagnosis: a broken main circuit board (AM-027) and the charge is USD250 including labor. When I went to Sony to pickup the camera- I also tried to purchase an extended warranty. However, as they checked the camera’s serial number- the staff said, sorry for they cannot issue a warranty for camera that is not purchased from an authorized dealer in Hong Kong, and those purchased from other country.. What a Duh! All the worse-my camera was purchased originally purchased from Korea and not from Hong Kong, and the owner didn’t give any information where. Lesson in a nutshell is (IMHO)- welcome to the inevitable life of materialism, the older you become, the more you get entangled. When you select a brand to support, you automatically trust the name and become like their subject or future slave :) In my case, it is Sony. Sony promotes buying only from an authorized dealers, at the current suggested retail price. If you cannot afford their price, sorry about that. Now, for your obedience in this system, you will receive a reward called- a trustworthy Sony warranty, not a “shop” warranty, but a real deal Sony free services. And in the future, a chance to purchase an extended warranty. This is how the sheep is separated from the wolves, how you separate the “can afford” to those who cannot. And those who don’t belong to their party, will not be worthy of any warranty or services. I feel so bad that I dared enter this grey market system. Should I just sell my newly repaired camera so other people may be pissed-of like me when it breaks again while in their custody? Or perhaps I will just try to join some camera contest to win and finally redeem the USD250 that I loss from repair. I just cling to the latter idea though it’s just psychologically difficult for me to keep a gadget that reminds me of bad experience and loss. This purchase of mine is supposed to be an upgrade from my old camera, but I guess it is wisdom that I gained more rather than a new camera. May this lesson serve you. Think twice before entering the risky world of grey market. By your own account, had you purchased it in the US of A, the warranty is not as good, which means you would’ve had no warranty and who knows how much you would’ve needed to pay! LOL That’s a joke right? Authorised dealers are hardly ever cheaper than other retailers. You made my day with that comment. Great article Robert…I am considering purchasing the D850 outside of Canada (In the US) based on the difference in cost but will now have to weigh this into the equation. Sounds like the issue was with shipping over the border and for me the border is only about a one hour drive away so I suppose I could just take it back to the dealer directly if I had any issues with the camera. I agree that the warranty should be offered for it’s full length across borders if purchased through an authorized dealer. With many people migrating to different countries, it seems petty on the company’s behalf to not honour the full warranty in these situations. Focus Camera is listed as an certified Nikon Imaging dealer. All the dealers I have bought from in the past are back ordered on the D850 so I am concerned as to why Focus would have it available. Have any of you bought from Focus or heard of them before? What is the difference between Nikon Imaging dealer and Nikon Professional dealer?